The Dark Tower: The Long Road Home is a monthly five-issue comic book mini-series, a spin-off of Stephen King's sci-fi western novel series of the same name. The first issue was published on March 5, 2008. It is the second of five such miniseries based on those novels, following the 2007 mini-series The Dark Tower: The Gunslinger Born. 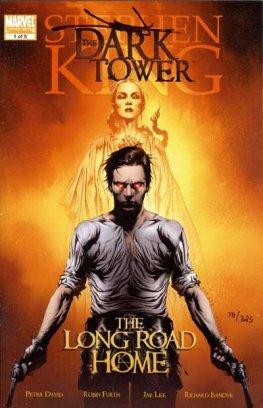 The story depicts the title character of Roland Deschain as he returns to Gilead from Mejis. 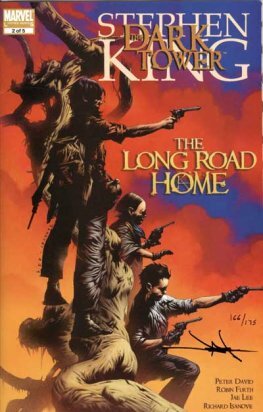 Whereas The Gunslinger Born was largely based on the events of The Dark Tower IV: Wizard and Glass, The Long Road Home showcases mostly new material not found in any of the novels. The series is written and illustrated by the same creative team as The Gunslinger Born, which includes writers Robin Furth and Peter David, and illustrators Jae Lee and Richard Isanove. On March 5, 2008, David and Lee appeared at a midnight signing of the first issue of the series at Midtown Comics Times Square, as they had done the previous year with The Gunslinger Born.